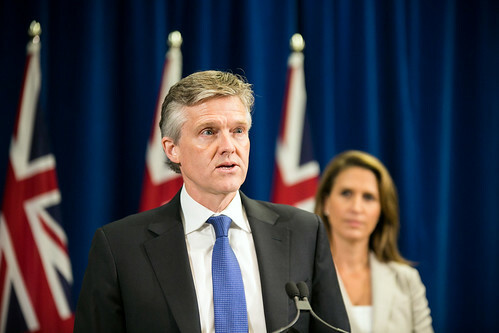 Minister of Environment, Conservation and Parks Rod Phillips and Attorney General Caroline Mulroney announced that the Government of Ontario will take immediate steps to challenge the constitutionality of the federal government's carbon tax at the Ontario Court of Appeal. Le ministre de l’Environnement, de la Protection de la nature et des Parcs, Rod Phillips, et la procureure générale, Caroline Mulroney, annoncent que le gouvernement de l’Ontario prendra des mesures immédiates pour contester devant la Cour d’appel de l’Ontario la nature constitutionnelle de la taxe carbone du gouvernement fédéral. This official Ontario Government photograph is being made available only for publication by news organizations and/or for personal use by the subject(s) of the photograph. The photograph may not be manipulated in any way.